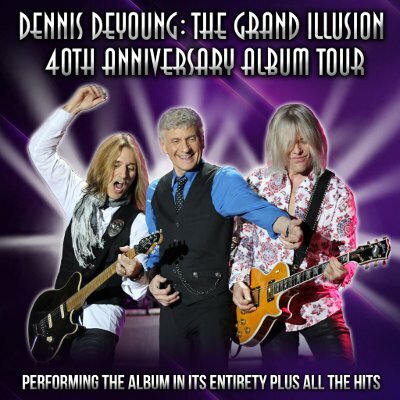 Dennis DeYoung is about to begin a special live tour celebrating the 40th Anniversary of Styx's iconic 1977 album release, The Grand Illusion. DeYoung will reflect back on more than 4 decades of musical excellence throughout the performance. This includes performing the entire Grand Illusion album plus all the greatest hits written and sung by DeYoung including - “Come Sail Away,” “Babe,” “Mr. Roboto,” “The Best Of Times,” and “Lady.” Other hit songs attendees may expect include fan favorites "Renegade," "Blue Collar Man," "Suite Madame Blue" and more. 2018 offers opportunities for fans to see Dennis DeYoung and his band at a hometown venue. New dates are being added and ticket sales are available through DeYoung’s official website. This story sounds more like an advertisement than actual music news. Me thinks DeYoung thinks more of himself than is realistic. Styx is out there rocking it just fine without him, thank you. Actually Styx is now listenable, without DeYoung's cabaret voice.